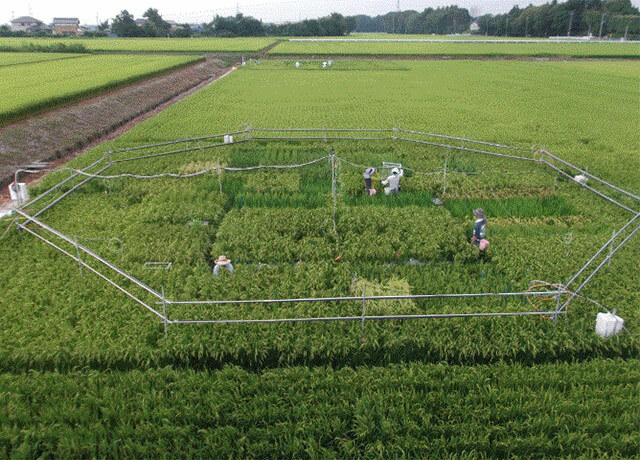 Rice within the octagon in this field is part of an experiment started by a University of Tokyo professor and designed to grow rice under different atmospheric conditions. Kristie Ebi and Adam Drewnowski, co-authors in this international study, are University of Washington researchers in public health and medicine. The reported changes in micronutrients were expected based on how elevated concentrations of CO2 affect plant physiology, increasing the carbohydrate content (e.g., starch and sugars) and reducing protein and mineral content. Changes in B vitamins may relate to the well-established decline of nitrogen in plants exposed to elevated concentrations of CO2, Ziska said.